On 15th August 2009, on the occasion of India's independence day I happened to be in Lausanne. To mark this occasion, the Jungfrau railways in Switzerland had staged a unique and some might say crazy event - Cricket on Snow. I missed the event but it managed to generate a lot of interest among the local crowd. Till date, if you talk about cricket with the locals, a good sizable crowd recall this 'match' which was played on the high altitude of Bernese Alps. For a lot of them including the locals, cricket is an 'alien' sport - a game which is 'alive' and played in Switzerland mainly through the efforts of the expat community. Switzerland might have contributed only a handful of players representing the national squad - but there is no denying of the fact that a lot of support has been received over the years to make this game co-exist among other popular games of this land. 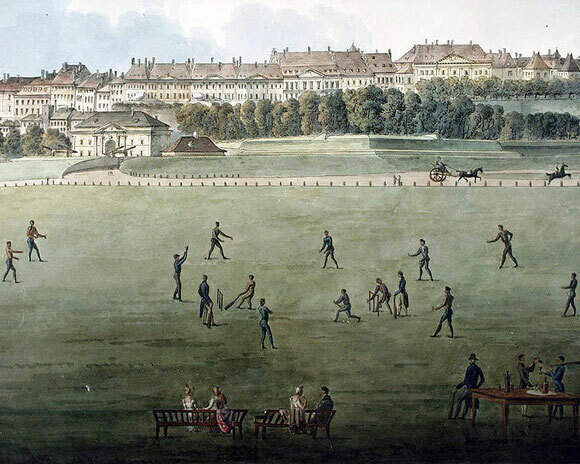 It is worth mentioning the oldest reference to cricket in Switzerland dates back to early 19th century - courtesy of a painting by Giovanni Salucci of a cricket match in progress at 'Plaine de Plainpalais' in Geneva. Since that time, cricket never really became a household name and it was cast aside as a 'foreign sport'. The official cricket association took its birth only in 1980 and achieved ICC 'Affiliate status' in 1985. It was during this time in the 1980's the IMG's then head and top honcho Mark McCormack made frequent trips to St. Moritz - a canton in Switzerland. St. Moritz, a place also known as 'Top of the World' - a positioning slogan created by the International Management Group (IMG) in 1987. A city which has hosted Winter Olympics twice (1928 and 1948) and currently home to the annual White Turf horse racing events along with skijoring (dates back to 1907) is a popular spot for Swiss and international tourists during winter. 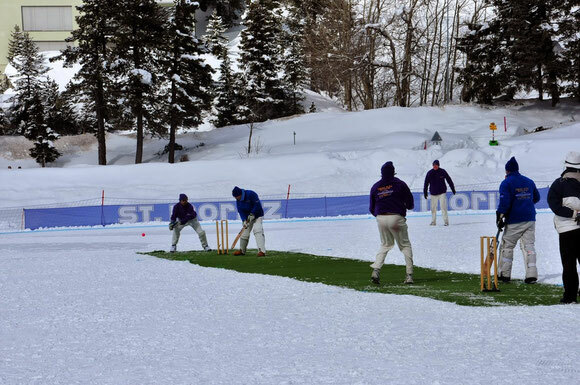 Add to this, Cricket on Ice - an annual event which is now part of St. Moritz's legacy. The uniqueness of these three events are that they take place in February each year on the frozen lake of St. Moritz. Mark McCormack in one of his many visits had plans to introduce a lot of sporting activities packaged as 'events' in this part of the region. In one of his conversations with Martin Berthod, who now is the Director of Sports and Events for St. Moritz recalled - "Mark expressed his desire to bring cricket and be played on ice. Thus 'Cricket on Ice' took its birth in 1987. 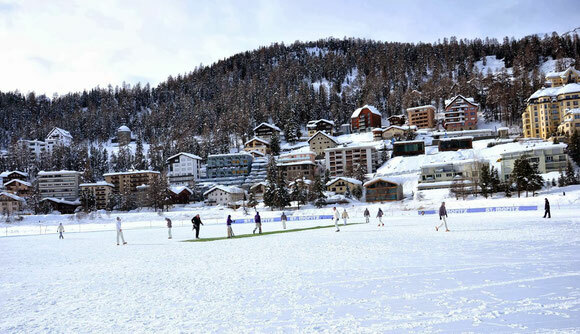 Except for one year (owing to bad weather) the annual festival of snow and cricket has been a regular event annually coinciding with the 'White Turf'". A Swiss local, Martin visits the site when the cricket is in progress to ensure there is smooth functioning of the event. He is responsible for preparing the ice turf, the outfield (with the aid of equipments and his team) and for any other aid required. He might not be too interested in playing this sport but remains the only constant person since its inception. He is friendly and he is just a call away if you ever need him. The tournament began with a bang. Trans World International (TWI) - an arm of IMG produced and recorded a lot of footage of this event in the wee years of this tournament. It attracted a lot of cricketers from the international arena - mainly from England to take part in this 'unparalleled' cricket event. David Gower, one of the talented English batsman was once part of this event. He would remember the event for a different reason. His car parked at the parking area caved in and went into the lake in what otherwise was a rock solid ice turf. Every event has its set of 'tales' and this particular incident gets recycled each year. Over the years the commercial sheen has been lost with a reduction in number of sponsors and IMG not being a part at this event. And yet the sole organiser, the St. Moritz Cricket Club attracts team on an invitation basis each year and continues to run the event with same passion and interest that brought this event in the first place.